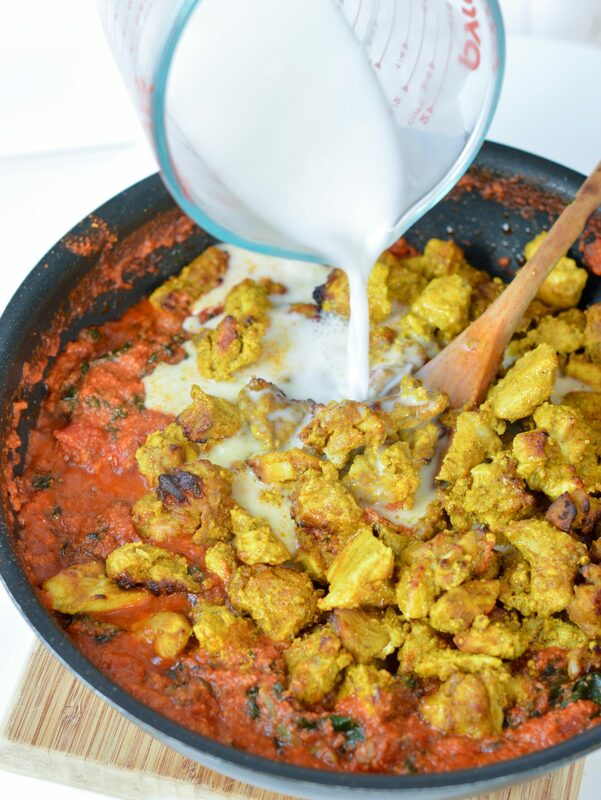 Who is ready for an healthy Chicken Tikka Masala recipe? This is one of new delicious healthy dinner recipe. 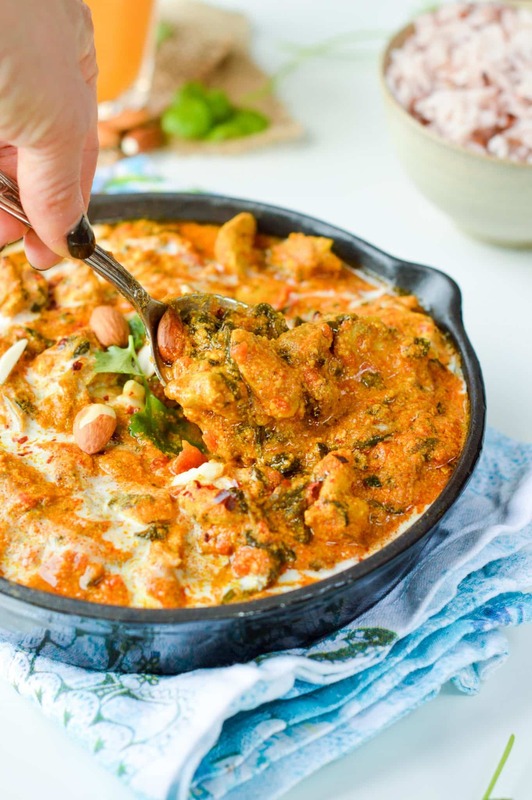 A low carb comfort dinner with fragrant Indian spices and creamy almond sauce. Yep! you heard me well, no cream here only ground almond to create the most healthiest creamy Indian curry ever! I love Indian food during winter. It is not only a heart-warming comfort dinner good for the soul. It is also a great anti inflammatory meal full of healing spices – like turmeric, garlic and ginger. Now you probably want to ask me, Carine, what makes this healthy chicken tikka masala good for you? First, don’t get me wrong here, an Indian curry is not obviously unhealthy. The problem is that many Indian restaurant use cream in their curry which load the meal with unhealthy fat and extra calories you don’t need. Instead, my healthy tikka masala recipe don’t use any cream or unhealthy fat. The lovely creamy texture is naturally coming from ground almonds that add plant-based protein and healthy fat to your diet. The chicken is marinated in low fat yogurt – a great skinny alternative to add moisture to your meat without the extra calories and bad fats. Also, I baked the marinated chicken to avoid extra fat from frying the meat. I also used UHT unsweetened coconut milk for the sauce which contains only 16 kcal per 100 ml. It is a healthy alternative to canned coconut milk that usually contains lot of kcal and fat. 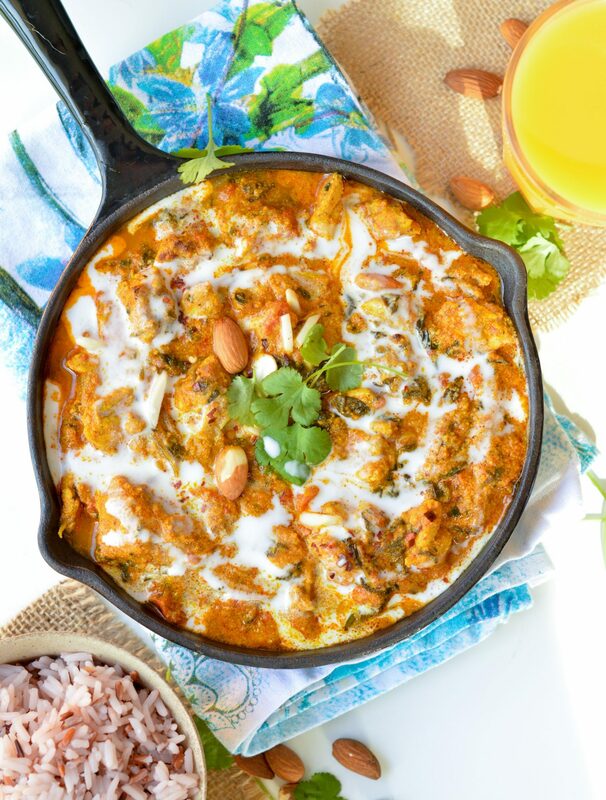 So I am proudly adding this healthy chicken tikka masala recipe in my blog collection of delicious and easy clean eating recipes. Yeah! As you know I am trying to reduce my meat consumption. Now, I am making this recipe with firm organic tofu instead of chicken tight. Great news, the recipe works like magic with both! So if you are vegan and you want to indulge on some healthy tikka masala recipe this one is perfect for you too. 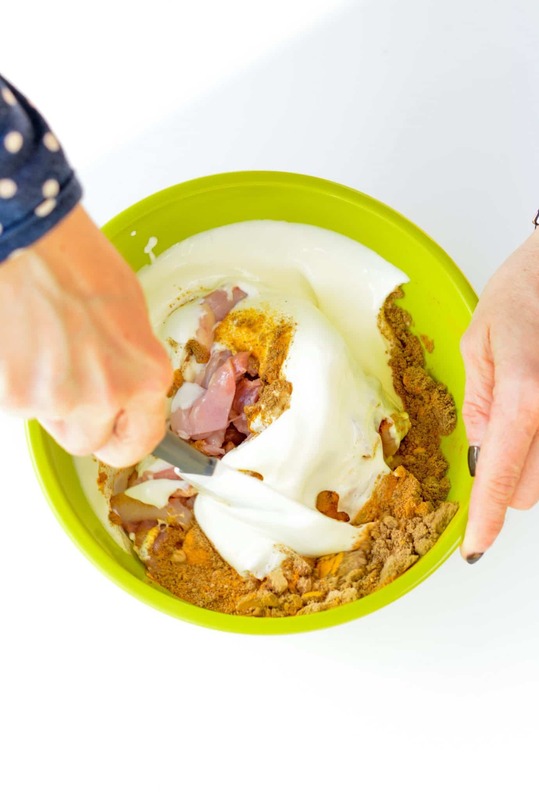 Of course replace the low fat yogurt by soy yogurt to keep the recipe cruelty free! Finally, remember that an healthy Indian curry should be served with healthy carbs! Think about all the healthy grain alternative to white rice like cauliflower rice, brown rice, quinoa or buckwheat ! 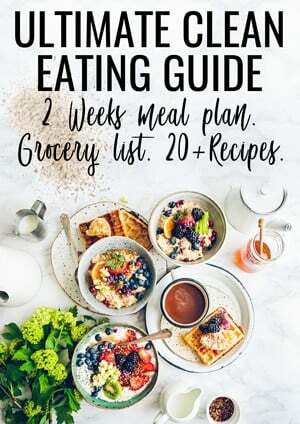 It will load your plate with fiber and plant-based protein. I hope you enjoy this delicious healthy dinner. Me, I have got my baby 5 months immunization today. I hate it. But I have to go now. Enjoy the recipe! 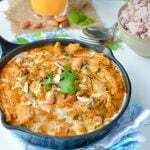 Healthy Chicken Tikka Masala recipe with no cream. 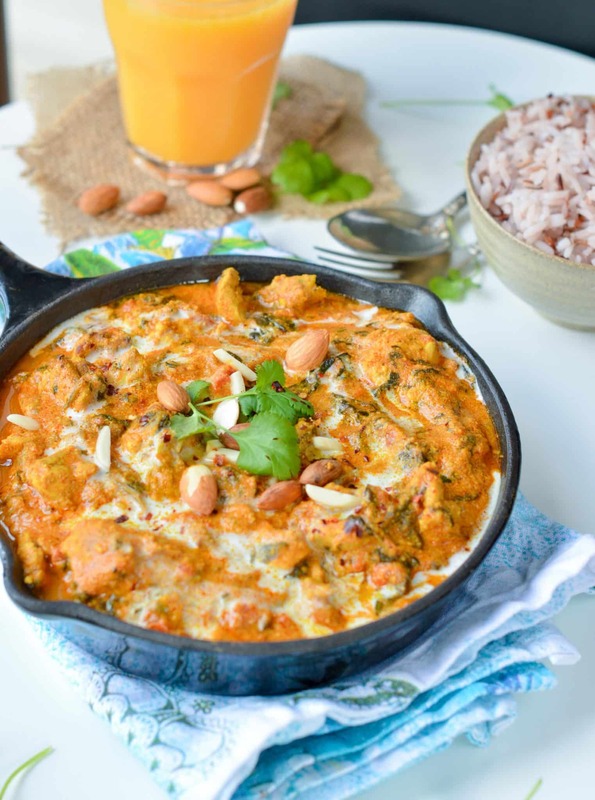 A delicious dairy free and creamy indian curry made of almonds. Skinny, low carb comfort foods recipe. In a small mixing bowl, place the diced chicken, yogurt, lime, garlic and add all the marinade spices. Toss until all pieces are well coated with the yogurt marinade. Set aside in the fridge - the longer the better I like to keep it 1 hour in the fridge. Meanwhile prepare the sauce. Preheat oven to 390 F (200 C), broil mode. In a large frying pan, under medium heat melt the coconut oil. Add the onion and fry for 2-3 minutes until slightly brown and fragrant. Add garlic and cook for 1 more minute. Stir in all the spices : ginger, garam massala, cumin, coriander, chili (if used), salt and ground almond. Cook for 1 minute until it forms a paste. Remove from heat. Set aside. Add the tomato paste, crushed tomatoes and water and bring the sauce to a boil. Reduce to low heat, cover partially and simmer the sauce until slightly thickened, about 15 minutes. Place the marinate chicken on a baking tray. Slightly spray the tray with olive oil to avoid the chicken to stick to the tray. Broil for 15-20 minutes or until the chicken is cooked through/charred. Make sure you stir the chicken pieces few times while cooking to cook each sides properly. When the chicken is baked transfer into the pan with the sauce . Return to medium heat and stir in the hot coconut milk. Cover with a lid and simmer on medium heat for 5 more minutes or until the sauce is thick. Stir in fresh coriander before serving if you like. Serve hot with brown rice or cauliflower rice for a low carb dinner. Store: can be store in the fridge up to 3 days in an airtight container. Freeze: can be freeze in an airtight container up to 1 month. Defrost the day before by leaving your curry in the fridge. Rewarm in a saucepan under medium heat or in a microwave for your work lunch. Can be defrost and rewarm in the same container that you used to freeze the curry. Make sure it is microwave proof container. Low carb sides: serve with cauliflower rice instead of rice. Vegan option: make this recipe vegan simply replace chicken with firm organic tofu and use soy yogurt for the marinade. Ginger: fresh ginger can be replace by ground ginger if you like. Use 1/2 teaspoon ground ginger. Milk: I used UHT unsweetened coconut milk for a low calorie healthy recipe. You can use canned coconut milk but be careful it is higher in fat and calories. Warm the milk in the microwave fr 1 minute on high heat or in a saucepan under medium heat until bubbles forms on the side of the saucepan - about 3 minutes. Herbs: it is optional but I love to stir in 1/4 cup fresh coriander at the end. That is the great parts on the picture. Yogurt: Coconut yogurt is made of 2 ingredients: coconut creama nd probiotic, it is keto, no added sugar. Replace by regular Greek yogurt if needed. I am vegan so I made it with tofu instead of chicken. Turn out great! Made it twice already and just wanna say how easy and tasty was this curry. Thanks for sharing! I am making it right now and it smells wonderful in my house. The recipe is very easy, I used tofu instead of chicken to make it vegan. Thanks for the lovely recipe Carine. Thanks Myriam ! I love the tofu option too. I am glad you love this simple indian curry recipe. See you soon on the blog, xoxo, Carine. I love your curry recipe Carine! I hate soaking cashews to make a creamy nut curry – time consuming- almond meal was the best alternative. Plus it is not too spicy the kids love it too. Hi, This looks yummy! Just curious…Is there spinach in the one pictured here? HAHA yes well spotted! I did not mention it in the recipe because it is an extra tweak I give to the recipe to make my kids eat there greens. I just added a handful of spinach at the end, stir and cook until soft like 2-3 extra minutes. It is very optional, just like the extra greens ! Enjoy. XOXO Carine. It was an interesting dish, really easy to make and restaurant-like result. Nevertheless, personally, I did not get the satisfaction I was looking for. Definitely, a recipe that I will play with by changing either the spices or the meat because it is a really every-day-kitchen-skills plate.